Nearest: Tube Station: Kensington (Olympia) 0.2 miles (0.4 km), Railway Station: Kensington Olympia 0.3 miles (0.5 km), Motorway: M4 Junction 1 3.1 miles (5 km). The Avonmore Hotel London is located close to Olympia exhibition centre and the massive Earls Court development (less than half a mile from the hotel). The hotel is also within walking distance to one of London's most popular shopping areas at Kensington High Street. To the west of central London this is convenient for Heathrow airport which is an easy taxi ride , about 20 minutes via the A4/M4. You can also make this journey via the Tube using the Piccadilly line which stops at all terminal's. Walking distance from West Kensington tube (500 metres) which is on the District line. The Avonmore Hotel is a traditional Victorian period house which has been converted into a private and intimate hotel. Each bedroom has been decorated in a classic English style. Facilities include hairdryer, direct dial telephone, colour television, radio alarm clock, telephone, WiFi, mini bar with drinks and tea and coffee making facilities. All but two of the bedrooms (a triple and a single) have private bathroom facilities. The hotel serves an breakfast in the cheerful breakfast room where a full cooked breakfast (bacon, eggs, sausages, tomatoes and baked beans) or continental (fresh fruit juice, a selection of breads, cereals and jams) is an option. There is also an onsite bar open till midnight. Relaxing and coy the bar serves a varied selection of drinks. Complimentary WiFi throughout hotel. Safety deposit boxes and luggage storage facilities available. Compared to other London hotels: This hotel has been rated 70% by past guests. The London average is 80% and the average for 3 star hotels is 76%. Therefore this hotel is below average for its sector (star rating) . Another to Consider: A similar type of hotel (size, rating) nearby (1.2 miles, 1.9 km) would be the 3 star Travelodge Southwark Hotel, with rates that start from about £81 and which has an 80% guest satisfaction rating. If you are looking for something a bit cheaper then take a look at the Travelodge Central Tower Bridge. 0.2 miles from here (0.3 km), has been rated at 80% by past guests and has rates from around £51. 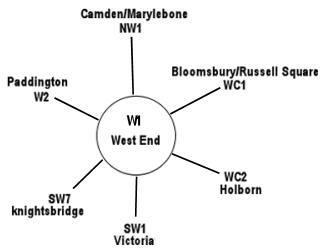 The fifty closest hotels from here (66 Avonmore Road, W1 postcode) that we have data for cover a 0.9 miles (1.5 km) radius. The 50 are made up of 1 five star hotel (rated 88%), 23 four star hotels (average rating 81%), 22 three star hotels (average rating 74%) and 6 two star hotels (average rating 71%). Top 3 star hotels are Premier Inn Kensington Olympia and the Premier Inn Kensington Earls Court (both 88%). Coming out as the top rated hotel are The Nadler Kensington (4 star) and also the Hotel Xenia (4 star) (both joint top with 90%). Of the nearest fifty hotels we have base rates for all of them. The average rate for all the 50 nearest hotels is £96 per night. Starting from £44 at Lord Kensington Hotel (3 Star, 71%) up to £255 at The Bentley London (5 Star, 88%). Averages by star rating: Five Star average: £255, Four Star average: £117, Three Star average: £77 and Two Star average: £62. We use a proprietary algorithm to rank hotels based on user reviews but adjusting for contributing factors. We rank Avonmore Hotel 44th (joint) of 50 nearby hotels and 17th (joint) for the 22 three star hotels in the area. In terms of lowest starting rates this hotel is 10th of 52 (6th of 22 three star hotels.). Analysing both the base rates and overall rating for the hotel we rank it 25th of 48 for sheer value for money (Ibis Shepherds Bush was top).